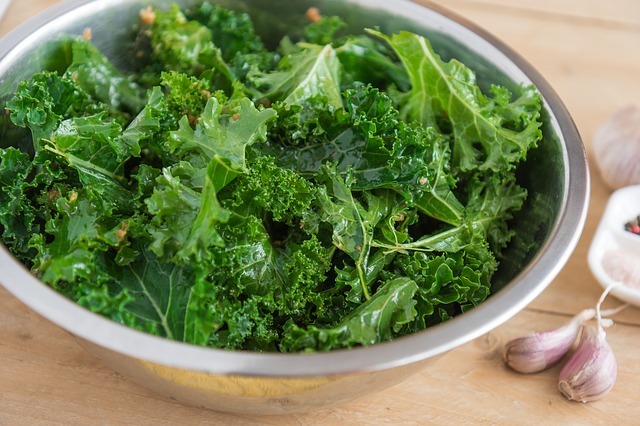 Take the washed and dried kale and rip them into “chip” size pieces and place in a large bowl. Drizzle with olive oil, salt, and garlic powder and mix until evenly covered. Place kale onto prepared sheet in an even layer. Bake for 10 minutes. Flip over the kale to cook the other sides of the pieces. Bake for another 10 minutes until the edges just start turning brown. Monitor them well, or you’ll have burnt kale chips. Tip: You can use any spice… try onion powder, chilli, paprika, or even turmeric.